ALPR: Get Control and Intelligence Data from your traffic. Get Control and Intelligence Data from your traffic. Automatic Tag Reader at a Glance! 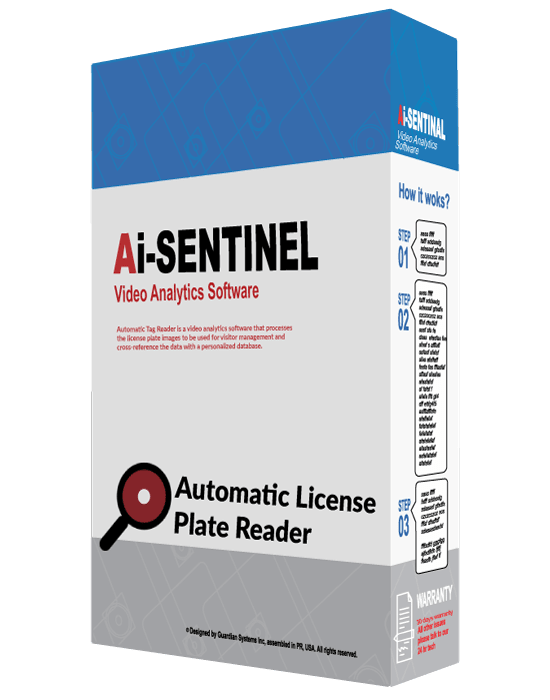 Automatic Tag Reader is a video analytics software that processes the license plate images to be used for visitor management and cross-reference the data with a personalized database. The software studies and identifies the vehicle tags image and convert the result into alphanumeric characters. It can be deployed in any natural access points where vehicles enter and exit the client's property. The software is customized to any geographic area to mask the legal parameters of the plate and guarantee proper detection and alphanumeric extraction. Ideal for vehicle control access, gated communities, parking lots, malls, and more. Get data of the vehicles and processes it into information that can be used for security and business analytics purposes. Know the current number of vehicles on site, visitor count, the capacity of parking lots, and recognize other security and safety patterns. Our software can also be installed in any current CCTV systems making use of existing hardware. It can also be deployed in mobile, remote or temporary locations. ¹Daily cost. Processing hardware, cameras, labor cost and other hardware are not included and can be quoted separately. Data transfer costs for notifications are not included are will be the sole responsibility of the client. Platform can be incorporated into any access control system via relay for automatic entry. ²Daily cost. Automatic Tag Reader Profile Database and Reporting Dashboard is made to order and can be customized for specific functionality like custom profiles (whitelist and blacklist) features, data analysis reports, notification parameters, plate counter options and other functionality required by the customer. The dashboard may take 1-2 week to deliver from order. ³Daily cost. Automatic Tag Reader Parking Management Dashboard allows the user to track parking capacity, tag counting, direct flow of traffic to available areas via monitors and relays, and other management tools required by the client. Hardware is not included. The dashboard may take 1-2 week to deliver from order. ¹Automatic Tag Reader Module minimum requirement is 5 devices (cameras). See TAG-ID for less devices. *Automatic License Plate Reader requires a 6-months software upgrade service. What is the difference between the Plate ID and the ALPR? They are both artificial intelligence platforms that identify license plates in a camera field of vision. The Plate ID is a product that is limited to 4 cameras or entry/exit points. If the User requires analysis in more than 4 cameras, the ALPR is right for you. Can the ALPR be synced to outside databases? Yes. We can sync the internal ALPR database with any other database. We can even connect to the local police department’s stolen vehicle registry to provide an added level of security to the client. What is the distance of recognition of a license plate? It depends on the type of camera. A regular 720p camera will allow detection from up to 15 feet. For more distance we simply use higher powered cameras.